I just bought 10 mock exams (online practice testing) on the 16th of June, 2008 to test if I'm well prepared without taking any review. Fortunately, on my first mock exam try I got a grade of PASS, the same as the second and third exam. My fourth until the last (which is 3 days before my exam) I got an EXCELLENT grade. I just consumed 6 out of 10 because some questions were repeated most of the time. Below is my last mock exam. Taking the mock exam helps me a lot, since the exam revealed the topics which I got a grade of FAIL, which I could say that it's my weaknesses and needs to focus more attention in review. I read some blogs that they found really difficult in the mock exam compared to the actual exam, based on my experience they're in the same level of difficulty. you are awesome sir., I had a talk with another zce from the other side of the world, and he told me that when taking a mock exam, don't accept any pass, it should only be excellent. by the way, congratulations again as being the 15th zce in the philippines CHEERS! I m planning to give zend PHP 5 certification. 1. How does the result of the certification exam look like? Is it in terms of %age marks or grades. 2. If it is grade, can you list out the grades and what is the minimum grade considered decent. 3. Was wondering if you have a pdf or something of the mock tests which you can share. Thanks for dropping by and sorry for the late response I'm kinda busy a couple of days ago. 1. The result of the certification is just a message informing either you pass or failed. In my case the first word appear on the screen was "Congratulations"
2. There are only two possible results, a PASSED and FAILED. I'm sure it's calculated based on the percentage of the correct answers over the total number of questions, though I'm not sure about the percentage of the passing grade, it could be 50% or more. 3. I have a Zend Certification Study Guide 1st edition copy in PDF though I'm not allowed to publish it here for legal issues. You can google it if you want and I know you can download it. 1st edition copy is fine though the 2nd edition has some corrections to the errata of the 1st edition and an additional topic for PDO. 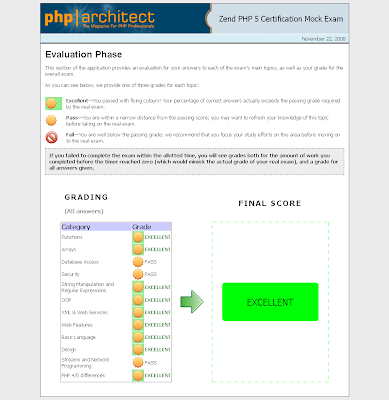 I suggest you buy a mock exam at Zend because that really helps you a lot for your preparations. Just email me if you want.